From This Point. Forward. : Exciting News! APL and I have some exciting news to share! And I'll bet from the picture you can already guess what it is! That's right....I'm pregnant! We are very excited to announce that we are expecting our second baby this summer! I've been meaning to write this announcement post for several weeks, ever since I crossed safely into the second trimester. Unfortunately, this pregnancy has been extremely difficult for me so far. I had "morning sickness" when I was pregnant with OZL, and I thought that was bad. Turns out that was extremely mild! I would trade this for that in a millisecond! I have been so very sick with this baby that I had to start taking prescription anti-nausea meds at about week 6. And really all that did was stop me from vomiting all day every day. I've had major issues in consuming enough nutrients and, unfortunately, I've even lost weight since becoming pregnant. About two weeks ago I reached a point where I couldn't even keep the anti-nausea medication down. I ended up at the OB's office one morning after throwing up three times before 10am. They gave me another form of the medication that dissolves in my mouth (instead of swallowing a pill). With the help of the new medication and, I hope, the advancing weeks of my pregnancy, I am cautiously starting to feel better. And while I am still having a great deal of difficulty planning or preparing meals for my family, I am doing slightly better with eating food that is put in front of me. I'm not gaining any weight yet but at least I'm not losing any more! And, throughout all this, the best news is that the baby is doing great! And now that I am starting to feel a tiny bit better I am ready to start sharing my pregnancy experiences with the RA community. It's very important to me to share my experiences because pregnancy is another RA topic that I feel is not addressed nearly as much as it should be - especially considering that such a large percentage of people with RA are women and many of us are still quite young! When I was ready to get pregnant for the first time I was desperate to find stories of other women managing to survive pregnancy and RA at the same time. Unfortunately, aside from one book (that I had to order all the way from Australia) and one brave blogger (who is now also expecting her second baby!!) I just couldn't seem to find very much good information. This is a gap that I'd really like to help fill if I can. I shared stories from my first pregnancy on this blog. This time I am really excited to have the opportunity to share my pregnancy stories on RheumatoidArthritis.net. Not only will that platform allow me to reach a wider audience, but through the search engine optimization work they are doing I may also be able to reach women who are blindly Googling "RA and pregnancy" - like I was before my first baby. So look for my pregnancy stories on the RheumatoidArthritis.net blog, and I will post links here as well. And wish me luck that I start feeling better soon - because I still have a long way to go! So happy for you! Congrats and I hope you feel better soon! Congratulations, Mariah! That's just wonderful news! I hope the sickness part of this pregnancy will be over very soon for you. 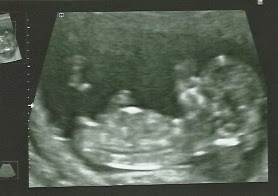 It's great that you blogged about your last pregnancy and plan to during this one, as well. You're right that there's not enough information out there about RA and pregnancy. I was diagnosed when my daughter was 7, so I didn't have to deal with pregnancy AND RA, thank goodness. But I do know how tough it can be to be a mom, a wife while having RA, too. You'll have all sorts of experience! Maybe there's a book in your future. Take care, feel better. Sending hugs your way. Congratulations! That is very exciting news. I stumbled across your blog when I was wondering about remission and pregnancy last year. We have just had number two as well, he's 7 weeks now. Hope your morning sickness continues to subside. Thanks for a great resource! Congratulations, I'm so happy for you! Sorry to hear you've suffered so much with morning sickness, I hope the new meds are helping. Hang in there and thanks for the mention in your post. :) Congrats again! HEATHER: Thanks! I'm almost 18 weeks now and still dealing with some nausea and the RA is flaring - but I'm staying positive! CHRISTINA: Thank you and best of luck as your big day approaches!! Thank you and good luck. I am 7 weeks and feeling the morning sickness myself. My RA is on the back burner of my mind right now because of how bad this pregnancy makes me feel. I am interested in learning some tricks of the trade when I do have this baby on how to take care of one with RA. Thank you for sharing.